Sign up to Newsletters. 11KW 220V Swimming Pool & SPA Hot Tub Electric Water Heater DigitalThermostat. Here’s our fixed price listing. Series pool heaters are special used for small pool less than 5CBM, massage pool and hot spring to heat and keep warm; Meanwhile, can be a assistant for heat pump in heating. This product adopts latest constant temperature controller, temperature sensor replaces traditional magnetic flow switch, it improves greatly of trouble free in working time, adaptability of water environment and stability. Read through the manual carefully to know better about the heaters installation and operation, and check the parameters before installation. Check the circulation system first before turn on the heater. Never disassemble the heater when connecting to power supply. Never turn on the heater without water. No power switch is designed for the heater. The front panel switch can only turn off the controller, thus you should cut off the main power supply before performing maintenance or repair. Proper grounding is important. Start the circulation pump for at least 2 minutes before turn on the heater, and turn off the circulation pump at least 2 minutes after turn off the heater. 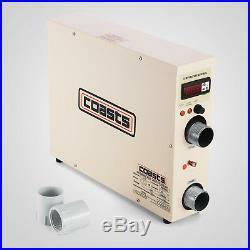 Once unexpected high temperature 60140occurs, the temperature switch cuts off the system. You need to cut off the main power supply, resolve the fault and wait the temperature to fall below normal temperature, then press the Reset button to restart the heater. Control system automatically heat-up procedure. Once reconnected to power or if the water temperature is 1 below the user setting temperature at least 10 minutes after entering the waiting stage, the heater enters the preparation stage. If hint message does not appear on the panel within 2 minutes, and the water temperature is 1 below the user setting temperature after 2 minutes, the heater enters next stage pre-heat stage. In this stage, heater heats up for 10 seconds and waits for 90 seconds. Heating indicator lights for 10 seconds. If hint message does not appear on the panel and the water temperature is 1 below the user setting temperature, heater enters next stage heat-up stage. 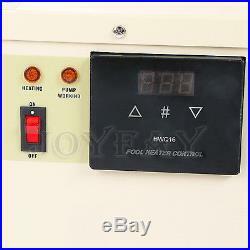 In this stage, all heating elements turn on, and heating indicator turns on as well. If hint message does not appear, heater will heat up to 1 above the user setting temperature, then heating indicator blinks for 2 minutes. After that, circulation pump turns off for models with circulation pump control. Heater enters next stage waiting stage. Waiting stage lasts for at least 10 minutes. 10 minutes later, if the water temperature is 1 below the user setting temperature, the heater jumps to preparation stage, otherwise, it remains in the waiting stage. The automatically heat-up process is non-stopping and will continue to circulating through all stages until the control system or heater is power off. You could ask for models with separated circulation pump control function. Increase the user setting temperature by 1 or 2. Decrease the user setting temperature by 1 or 2. Switch between temperature unitPress button for more than 3 secondspanel displays and in turns. Release the button once the unit you wish to choose appears, 5 seconds later, panel restore to display the current water temperature. Switch between temperature sensorsPress button, the panel will blink and display temperature measured by temperature sensor 2. After 5 seconds or press thebutton again, panel will restore to display current water temperature which is measured by temperature sensor 1. Temperature display and setting. Temperature display range 653 or 43127. 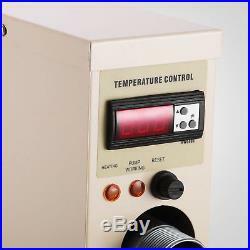 Temperature setting range 2250 or 72122factory default temperature is 42. Press or button to increase or decrease the setting temperature by 1(2)and the panel blinks and display the setting temperature. 5 seconds later, the panel stops blinking, confirm the setting change and restore the current temperature display. If reconnected to power, the user setting temperature is set to default temperature 42. The flow-temperature sensor is always under the control of software, accurately monitoring the temperature status of the whole system, and then adjust the settings to maintain the water temperature and protect the heater from unexpected situations. 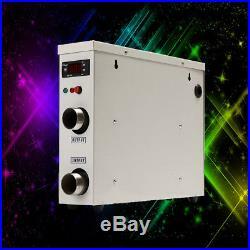 No mechanical sensors, avoid any mechanical failure to affect the function of the heater. Avoid affection of ion accumulation to mechanical sensors. Greatly reduce unnecessary circulation cycles, prolong the life of circulation pumps and save more energy. The control system keeps on monitoring the running status of every parts of the heater, and quickly reacts and displays corresponding hint message for any incident, so as to avoid any damage or malfunction happens. If any fault happens, the heater is stopped immediately, and corresponding hint message will display on the panel for user or technician to decide where the fault is. The safety of customer is the top priority. Manual reset temperature control switch: Once unexpected high temperature 60 occurs, the temperature switch cuts off the system. Unique control system: ST series are the newest generation with our unique control system. Sensor technique are: A. The flow-temperature sensor is always under the control of software, accurately monitoring the temperature status of the whole system, and then adjust the settings to maintain the water temperature and protect the heater from unexpected situations; B. No mechanical sensors, avoid any mechanical failure to affect the function of the heater; C. Avoid affection of ion accumulation to mechanical sensors; D. Intelligent self-diagnose function: The control system keeps on monitoring the running status of every parts of the heater, and quickly reacts and displays corresponding hint message for any incident, so as to avoid any damage or malfunction happens. Housing material: Aluminum-coated plate. Net Weight: 7.5 kg/16.5lbs. 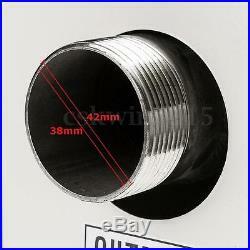 Package Size: 120560380 mm/4.72214.9. 1 x Pool Heater. As a leading and emerging company in manufactory and exporting business, we are specialized in Business and Industrial Products, Sporting Goods, Pet Products, Home and Garden products for more than 10 years. We believe that it is our vision and mission to provide innovative products with best service and competitive price to satisfy you. Our goal is to make sure that you can find exactly what you are looking for and make it easy for you to place your orders. If you have any changes, pls inform us. These charges are the buyers responsibility. If you need to return, please check twice to confirm the item not work and contact our customer service representative, let us know the detailed problem and send us some pictures for confirmation. Please make sure that item has NO man-made sabotage. Used items will not be accepted for return. All emails will be responded to within. Leave a Message if. You want to cancel an order. If you need further assembly instructions for a product. Any other unspecified questions or concerns. Special circumstances will be listed clearly in the listing. Please do check everything carefully after you received the parcel, any the damage except DOA (Dead-On-Arrival) would not be covered if it’s your fault. A: The item ships from Rancho Cucamonga, CA, United States. A: Please log on your account. Q: How do I return an item? Please contact our customer service before you return an item. The item “11KW 220V Electric Swimming Pool Water Heater Thermostat Hot Tub Jacuzzi Spa” is in sale since Friday, August 25, 2017. This item is in the category “Home & Garden\Yard, Garden & Outdoor Living\Pools & Spas\Pool Equipment & Parts\Pool Heaters & Solar Panels”. The seller is “happykisssoul” and is located in Ontario, California. This item can be shipped to United States, all countries in Europe, Canada, Australia. 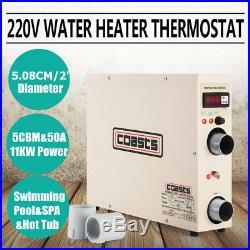 11KW 220V Swimming Pool & SPA Hot Tub Electric Water Heater DigitalThermostat. Series pool heaters are special used for small pool less than 5CBM, massage pool and hot spring to heat and keep warm; Meanwhile, can be a assistant for heat pump in heating. This product adopts latest constant temperature controller, temperature sensor replaces traditional magnetic flow switch, it improves greatly of trouble free in working time, adaptability of water environment and stability. Read through the manual carefully to know better about the heaters installation and operation, and check the parameters before installation. Check the circulation system first before turn on the heater. Never disassemble the heater when connecting to power supply. Never turn on the heater without water. No power switch is designed for the heater. The front panel switch can only turn off the controller, thus you should cut off the main power supply before performing maintenance or repair. Proper grounding is important. Start the circulation pump for at least 2 minutes before turn on the heater, and turn off the circulation pump at least 2 minutes after turn off the heater. Once unexpected high temperature 60140occurs, the temperature switch cuts off the system. You need to cut off the main power supply, resolve the fault and wait the temperature to fall below normal temperature, then press the Reset button to restart the heater. Control system automatically heat-up procedure. Once reconnected to power or if the water temperature is 1 below the user setting temperature at least 10 minutes after entering the waiting stage, the heater enters the preparation stage. If hint message does not appear on the panel within 2 minutes, and the water temperature is 1 below the user setting temperature after 2 minutes, the heater enters next stage pre-heat stage. In this stage, heater heats up for 10 seconds and waits for 90 seconds. Heating indicator lights for 10 seconds. If hint message does not appear on the panel and the water temperature is 1 below the user setting temperature, heater enters next stage heat-up stage. In this stage, all heating elements turn on, and heating indicator turns on as well. If hint message does not appear, heater will heat up to 1 above the user setting temperature, then heating indicator blinks for 2 minutes. After that, circulation pump turns off for models with circulation pump control. Heater enters next stage waiting stage. Waiting stage lasts for at least 10 minutes. 10 minutes later, if the water temperature is 1 below the user setting temperature, the heater jumps to preparation stage, otherwise, it remains in the waiting stage. The automatically heat-up process is non-stopping and will continue to circulating through all stages until the control system or heater is power off. You could ask for models with separated circulation pump control function. Increase the user setting temperature by 1 or 2. Decrease the user setting temperature by 1 or 2. Switch between temperature unitPress button for more than 3 secondspanel displays and in turns. Release the button once the unit you wish to choose appears, 5 seconds later, panel restore to display the current water temperature. 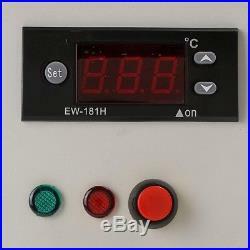 Switch between temperature sensorsPress button, the panel will blink and display temperature measured by temperature sensor 2. After 5 seconds or press thebutton again, panel will restore to display current water temperature which is measured by temperature sensor 1. Temperature display and setting. Temperature display range 653 or 43127. 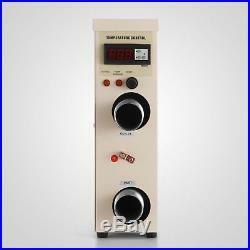 Temperature setting range 2250 or 72122factory default temperature is 42. Press or button to increase or decrease the setting temperature by 1(2)and the panel blinks and display the setting temperature. 5 seconds later, the panel stops blinking, confirm the setting change and restore the current temperature display. If reconnected to power, the user setting temperature is set to default temperature 42. The flow-temperature sensor is always under the control of software, accurately monitoring the temperature status of the whole system, and then adjust the settings to maintain the water temperature and protect the heater from unexpected situations. 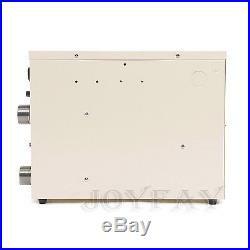 No mechanical sensors, avoid any mechanical failure to affect the function of the heater. Avoid affection of ion accumulation to mechanical sensors. Greatly reduce unnecessary circulation cycles, prolong the life of circulation pumps and save more energy. The control system keeps on monitoring the running status of every parts of the heater, and quickly reacts and displays corresponding hint message for any incident, so as to avoid any damage or malfunction happens. If any fault happens, the heater is stopped immediately, and corresponding hint message will display on the panel for user or technician to decide where the fault is. The safety of customer is the top priority. Manual reset temperature control switch: Once unexpected high temperature 60 occurs, the temperature switch cuts off the system. Unique control system: ST series are the newest generation with our unique control system. Sensor technique are: A. The flow-temperature sensor is always under the control of software, accurately monitoring the temperature status of the whole system, and then adjust the settings to maintain the water temperature and protect the heater from unexpected situations; B. No mechanical sensors, avoid any mechanical failure to affect the function of the heater; C. Avoid affection of ion accumulation to mechanical sensors; D. Intelligent self-diagnose function: The control system keeps on monitoring the running status of every parts of the heater, and quickly reacts and displays corresponding hint message for any incident, so as to avoid any damage or malfunction happens. Housing material: Aluminum-coated plate. Net Weight: 7.5 kg/16.5lbs. Package Size: 120560380 mm/4.72214.9. 1 x Pool Heater. Sign up to newsletter. As a leading and emerging company in manufactory and exporting business, we are specialized in Business and Industrial Products, Sporting Goods, Pet Products, Home and Garden products for more than 10 years. We believe that it is our vision and mission to provide innovative products with best service and competitive price to satisfy you. Our goal is to make sure that you can find exactly what you are looking for and make it easy for you to place your orders. If you have any changes, pls inform us. These charges are the buyers responsibility. If you need to return, please check twice to confirm the item not work and contact our customer service representative, let us know the detailed problem and send us some pictures for confirmation. Please make sure that item has NO man-made sabotage. Used items will not be accepted for return. All emails will be responded to within. Leave a Message if. You want to cancel an order. If you need further assembly instructions for a product. Any other unspecified questions or concerns. Special circumstances will be listed clearly in the listing. Please do check everything carefully after you received the parcel, any the damage except DOA (Dead-On-Arrival) would not be covered if it’s your fault. A: The item ships from Rancho Cucamonga, CA, United States. A: Please log on your account. Q: How do I return an item? Please contact our customer service before you return an item. The item “11KW 220V Pool Heater Thermostat Swimming Pool SPA Electric Water Heater Pump” is in sale since Thursday, October 19, 2017. This item is in the category “Home & Garden\Yard, Garden & Outdoor Living\Pools & Spas\Pool Equipment & Parts\Pool Heaters & Solar Panels”. 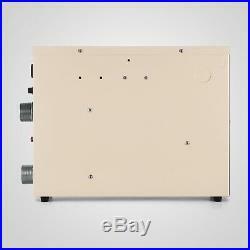 The seller is “technology-zoom” and is located in Ontario, California. This item can be shipped to United States, all countries in Europe, Canada, Australia. This product incorporates a wide range of refrigeration technology, simple operation and precise temperature control. Anti-interference ability, suitable for all kinds of refrigeration, heating equipment automatic intelligent control system. Sensors with a special precision machining package with moisture barrier, stable and reliable performance. 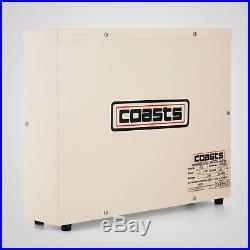 Specifications: Operating voltage: AC220V 50HZ / 60HZ Output load: 220V AC Power: 11 KW Working environment: -10 50 , RH? 90% Control range: -45 80 Resolution: 1 Accuracy: ± 1 Input signal: one road measure temperature sensor, 20K X 1.5m Machine size: 445 x 345 x 102mm/17.52 x 13.58 x 4.02inch Outer hole size: 42mm/1.65inch Inner hole size: 38mm/1.5inch Net Weight: 7.36kg Control system automatically heat-up procedure 1. Preparation stage Once reconnected to power or if the water temperature is 1 below the user setting temperature at least 10 minutes after entering the waiting stage, the heater enters the preparation stage. If hint message” does not appear on the panel within 2 minutes, and the water temperature is 1 below the user setting temperature after 2 minutes, the heater enters next stage pre-heat stage. Pre-heat stage In this stage, heater heats up for 10 seconds and waits for 90 seconds. Heating’ indicator lights for 10 seconds. If hint message” does not appear on the panel and the water temperature is 1 below the user setting temperature, heater enters next stage heat-up stage. Heat-up stage In this stage, all heating elements turn on, and heating indicator turns on as well. If hint message” does not appear, heater will heat up to 1 above the user setting temperature, then heating indicator blinks for 2 minutes. After that, circulation pump turns off for models with circulation pump control. Heater enters next stage waiting stage. Waiting stage Waiting stage lasts for at least 10 minutes. 10 minutes later, if the water temperature is 1 below the user setting temperature, the heater jumps to preparation stage, otherwise, it remains in the waiting stage. The automatically heat-up process is non-stopping and will continue to circulating through all stages until the control system or heater is power off. You could ask for models with separated circulation pump control function. Unique control system 1. The flow-temperature sensor is always under the control of software, accurately monitoring the temperature status of the whole system, and then adjust the settings to maintain the water temperature and protect the heater from unexpected situations. 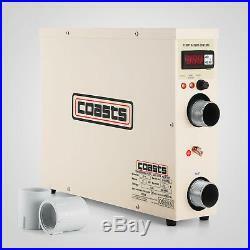 No mechanical sensors, avoid any mechanical failure to affect the function of the heater. Avoid affection of ion accumulation to mechanical sensors. Greatly reduce unnecessary circulation cycles, prolong the life of circulation pumps and save more energy. Before using the installation requirements: 1. The power supply voltage and the voltage marked on the machine to be consistent, deviation of supply voltage and the rated voltage is not more than ± 10%. The sensor should maintain an appropriate distance from the power line, avoid contact or close. The strict distinction between sensors, power lines and the output relay interface. A vailable in single phase and three phase configurations. 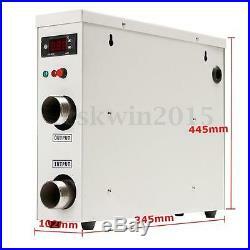 The heater is suitable for indoor or outdoor installation. See figure 1 for piping connections and figures 2A and 2B for electrical connections. Leave minimum clearance of 9 inches on the left, 12 inches both above and to the front and 6 inches on the back for service entrances and access. Note: This can only be used in pools around 8-10 cubic meters. 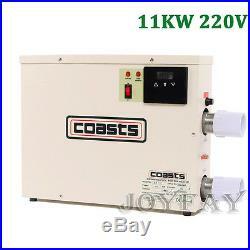 Package included: 1 x 11KW 220V Swimming Pool Electric Water Heater. International buyers please note: a. The item “11KW 220V Electric Water Heater Thermostat For Swimming Pool SPA Hot Tub New” is in sale since Thursday, August 11, 2016. This item is in the category “Home & Garden\Yard, Garden & Outdoor Living\Pools & Spas\Pool Equipment & Parts\Pool Heaters & Solar Panels”. 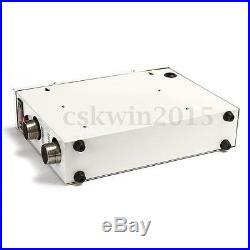 The seller is “cskwin2015″ and is located in HK. This item can be shipped worldwide. 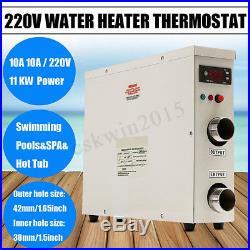 220V 3KW Swimming Pool SPA Hot Tub Electric Water Heater Thermostat 50/60Hz. This product incorporates a wide range of refrigeration technology, simple operation and precise temperature control. Anti-interference ability, suitable for all kinds of refrigeration, heating equipment automatic intelligent control system. Sensors with a special precision machining package with moisture barrier, stable and reliable performance. Specifications: Operating voltage: AC220V 50HZ / 60HZ Output load: 220V AC Power: 11 KW Working environment: -10 50 , RH? 90% Control range: -45 80 Resolution: 1 Accuracy: ± 1 Input signal: one road measure temperature sensor, 20K X 1.5m Machine size: 445 x 345 x 102mm/17.52 x 13.58 x 4.02inch Outer hole size: 42mm/1.65inch Inner hole size: 38mm/1.5inch Net Weight: 7.36kg Before using the installation requirements: 1. 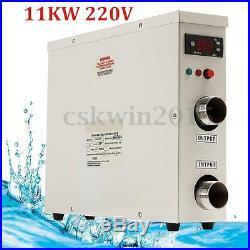 The power supply voltage and the voltage marked on the machine to be consistent, deviation of supply voltage and the rated voltage is not more than ± 10%. The sensor should maintain an appropriate distance from the power line, avoid contact or close. The strict distinction between sensors, power lines and the output relay interface. Note: This can only be used in pools around 8-10 cubic meters. 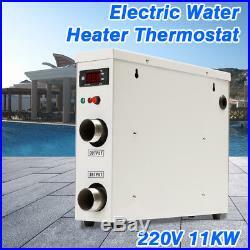 Package included: 1 x 11KW 220V Swimming Pool Electric Water Heater. International buyers please note: a. 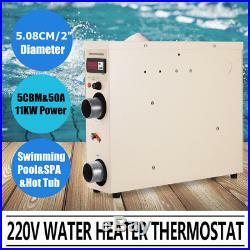 The item “11KW 220V Electric Water Heater Thermostat Home Swimming Pool SPA Hot Tub Gift” is in sale since Wednesday, May 23, 2018. This item is in the category “Home & Garden\Yard, Garden & Outdoor Living\Pools & Spas\Pool Equipment & Parts\Pool Heaters & Solar Panels”. The seller is “anglestore” and is located in Alloway, New Jersey. This item can be shipped to United States, Canada. 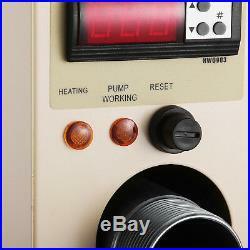 11KW Swimming Pool & SPA Hot Tub Electric Water Heater Thermostat. This Swimming pool heater is special used for small pool less than 5m³ (176.6 ft3) , massage pool and hot spring to heat and keep warm; Meanwhile, can be a assistant for heat pump in heating. This product adopts latest constant temperature controller, temperature sensor replaces traditional magnetic flow switch, it improves greatly of trouble free in working time, adaptability of water environment and stability. 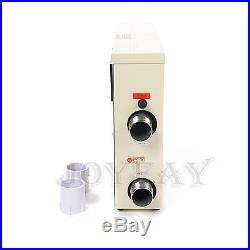 Upgraded type: Temperature control panel is separated from inlet and outlet, can be operated more easily. Pipe Dimeter: 1.5 inch. Net Weight: 7.5 kg. Package Size: 120560390 mm. That means you should have electrician’s foundation, electronics electrocircuit as well as simple machine knowledge. If not, please call an electrician to install this device. Manual reset temperature control switch. Once unexpected high temperature. Occurs, the temperature switch cuts off the system. You need to cut off the main power supply, resolve the fault and wait the temperature to fall below normal temperature, then press the Reset button to restart the heater. ST series are the newest generation with our unique control system. With this advanced control system, the traditional mechanical water flow sensor is replaced by modern digital temperature sensor, and the features of the temperature. The flow-temperature sensor is always under the control of software, accurately monitoring the temperature status of the whole system, and then adjust the settings to maintain the water temperature and protect the heater from unexpected situations. 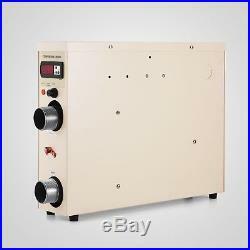 No mechanical sensors, avoid any mechanical failure to affect the function of the heater. Avoid affection of ion accumulation to mechanical sensors. Greatly reduce unnecessary circulation cycles, prolong the life of circulation pumps and save more. The control system keeps on monitoring the running status of every parts of the heater, and quickly reacts and displays corresponding hint message for any incident, so as to avoid any damage or malfunction happens. If any fault happens, the heater is stopped immediately, and corresponding hint message will display on the panel for user or technician to decide where the fault is. The safety of customer is the top priority. Buyers will be responsible for custom clearance and potential tariff. The amount of tariff is composed of two parts. If you need more time, please let us know. As your satisfaction is our utmost priority and goal, we will endeavor to resolve all of your problems until you are satisfied. We will help you solve all the problems as best as we can. All messages will be responded within 12 – 24 hours. Your recognition will make us more confident to develop business and serve you better. We are a company with rich experience in world trade. Founded in 2009, we are dedicated to serving our customers with great products and great service while keeping the quality high and the prices low. We also have rich products more than display in the store. The item “11KW 220V Swimming Pool & SPA Hot Tub Electric Water Heater Thermostat” is in sale since Monday, June 06, 2016. This item is in the category “Home & Garden\Yard, Garden & Outdoor Living\Pools & Spas\Pool Equipment & Parts\Pool Heaters & Solar Panels”. The seller is “zhuofei3371″ and is located in Nanjing. This item can be shipped worldwide. Hayward Comfortzone 11kw Spa Heater. Hayward electric spa heaters contain all of the sophisticated features and capabilities of heaters twice their size. 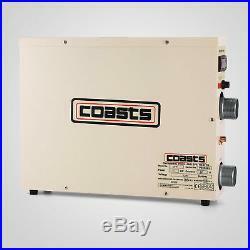 The electric heaters fit into compact spaces -even under spa skirts or steps. 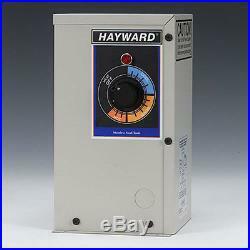 Like all Hayward heaters, they are easy to install and service. Perfect for Hot Tubs and spas Spas above 70 G. An external by pass is recommended. 304 stainless steel tank. 304 stainless steel threaded head, safety sensor electric heating element. Service-ease design gives simple access to internal controls. Heater on indicator light. We are unable to make changes or cancellations to orders after they are placed. We do not offer local pickups. Box & APO/FPO Addresses. Oversized deliveries are curbside only with FREE Lift Gate Service. If the combined weight of your order is 500 lbs. TO RETURN MERCHANDISE PLEASE FOLLOW THESE INSTRUCTIONS. Any item(s) received after 30 days will be denied and sent back to the customer at their expense. Not all items may be returnable. For example: Chemicals, Custom/Special Orders, Unfolded Covers, Opened Aboveground Liners, Drilled Solar Reels and Custom Commercial Furniture are all non-returnable. After 15 days all manufacturers warranties apply. Deliveries should be inspected and any visible damage should be notated prior to accepting the package. All damage claims must be submitted within 7 days of receipt by the customer, or a claim cannot be submitted. Insure the package for its full value. West Chicago, IL 60185. The item “Hayward 11kw Comfortzone Electric Spa Hot Tub Heater 240v” is in sale since Wednesday, February 08, 2017. This item is in the category “Home & Garden\Yard, Garden & Outdoor Living\Pools & Spas\Pool Equipment & Parts\Pool Heaters & Solar Panels”. The seller is “saveonpoolsupplies” and is located in United States. This item can be shipped to United States. Hayward Comfortzone 11kw Spa Heater. 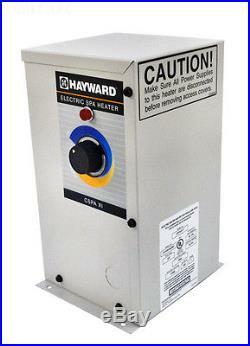 Hayward electric spa heaters contain all of the sophisticated features and capabilities of heaters twice their size. The electric heaters fit into compact spaces -even under spa skirts or steps. Like all Hayward heaters, they are easy to install and service. Perfect for Hot Tubs and spas Spas above 70 G. An external by pass is recommended. 304 stainless steel tank. 304 stainless steel threaded head, safety sensor electric heating element. Service-ease design gives simple access to internal controls. Heater on indicator light. We are unable to make changes or cancellations to orders after they are placed. We do not offer local pickups. Box & APO/FPO Addresses. Oversized deliveries are curbside only with FREE Lift Gate Service. If the combined weight of your order is 500 lbs. At Save On Pool Supplies , we strive to provide you with high quality products and are here to assist you before and after the sale. Damaged items: We inspect all packages for damage before they leave our warehouses. We reserve the right to require photos or samples of damaged or defective merchandise be sent to us. We cannot stop, cancel, or revise any order. We are a full service company and are here to assist you. We look forward to serving your needs! We answer all emails received, however in season due to the heavy volumes we experience there may be a delay in our response. The item “Hayward 11kw Comfortzone Electric Spa Hot Tub Heater 240v” is in sale since Wednesday, December 21, 2016. This item is in the category “Home & Garden\Yard, Garden & Outdoor Living\Pools & Spas\Pool Equipment & Parts\Pool Heaters & Solar Panels”. The seller is “saveonpoolsupplies” and is located in United States. This item can be shipped to United States. Hayward Spa or Hot Tub Electric Heater CSPAXI11 11KW (240V) – Brand New. The electric heaters fit into compact spaces – even under spa skirts or steps. Hayward model CSPAXI11 is Energy Efficient! Hayward electric spa heaters contain all of the sophisticated features and capabilities of heaters twice their size. 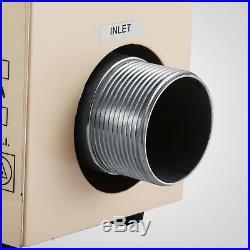 Like all Hayward heaters, they are easy to install and service. 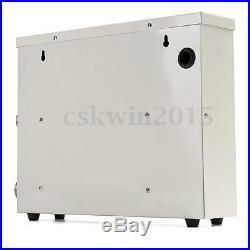 304 stainless steel tank 304 stainless steel threaded head, safety sensor electric heating element Service-ease design gives simple access to internal controls Heater on indicator light. 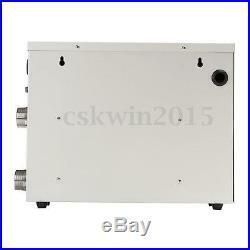 CSPA XI Electric Spa Heaters Model 11KW 240 Voltage Pipe Size 1.5. CSPAXl11 11 240V 1 1/2 1 14 lbs. The item “Hayward Comfortzone Spa Hot Tub Electric Heater CSPAXI11 11KW 240V Brand New” is in sale since Friday, February 19, 2016. This item is in the category “Home & Garden\Yard, Garden & Outdoor Living\Pools & Spas\Pool Equipment & Parts\Pool Heaters & Solar Panels”. The seller is “pool-store” and is located in Sunny, California. This item can be shipped to United States. 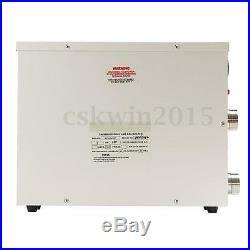 Hayward CSPAXI11 11kw Spa Heater. Hayward electric spa heaters contain all of the sophisticated features and capabilities of heaters twice their size. The electric heaters fit into compact spaces – even under spa skirts or steps. 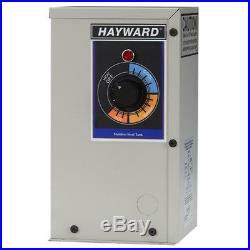 Like all Hayward heaters, they are easy to install and service. Spas above 70 G. An external by pass is recommended. 304 stainless steel tank. 304 stainless steel threaded head, safety sensor electric heating element. Service-ease design gives simple access to internal controls. Heater on indicator light. 1 1/2 Pipe size. We are a Authorized Hayward Dealer! Any damages must be reported within 24 hours of receiving the product. Please refer to you Owner’s Manual for the manufacture’s Customer Service telephone number. Tracking numbers will be emailed to you as soon as they are available. Special Notes For International Orders. Sellers: Get your own map today. 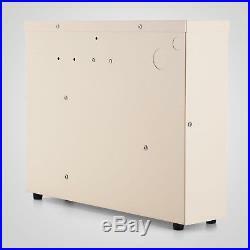 The item “Hayward 11kw Electric Spa Hot Tub Heater CSPAXI11″ is in sale since Thursday, November 12, 2009. This item is in the category “Home & Garden\Yard, Garden & Outdoor Living\Pools & Spas\Pool Equipment & Parts\Pool Heaters & Solar Panels”. The seller is “pool-and-spa” and is located in New Port Richey, Florida. This item can be shipped worldwide.